Try Vitamin C stocked in our UK shop for incredible health benefits. Liposomal Vitamin C are spherical vesicles containing Vitamin C nutrient, which gets administrated directly to the cells when taken. Therefore, liposomal vitamin C is more powerful than the traditional vitamin C. It's a staggering innovation helping the body to restore peace and harmony, available in our UK stores. Liposomal encapsulated Vitamin C turns out to be effective, as it delivers significant health benefits. Indeed, liposomal Vitamin C will reinforce your immune cells and improve your overall conditions, as your heart, lung or blood sugar. Our range of Liposomal Vitamin C includes several nutrients from the best European laboratory, like Altrient C with a bioavailability up to 98%! Lipolife, including the new Apple C, the most absorb-able liposomal Vitamin C. And Quicksilver Scientific, essential for detoxification programme. 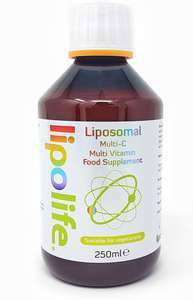 The liposomal encapsulated nutrients we stock in the UK: liposomal Vitamins, liposomal Vitamin B, liposomal Glutathione.